This special pack celebrates a relationship between James Bond and Aston Martin that has lasted for over fifty years. 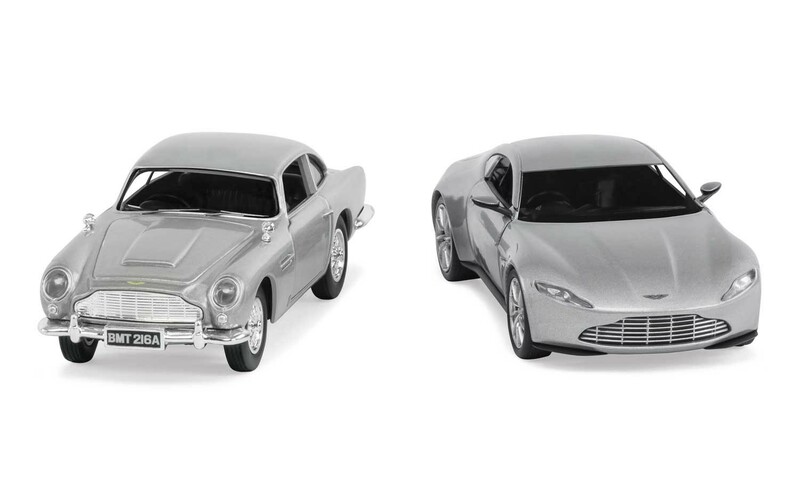 This pair of 1:36 scale models includes the Aston Martin DB5 and the new Aston Martin DB10, both of which appear in the latest James Bond film, Spectre. In Spectre, the 24th James Bond film, a cryptic message from the past sends Bond on a rogue mission to Mexico City and eventually on to Rome, where his new Aston Martin DB10 is involved in a high speed chase with a Jaguar C-X75 through the city’s streets and along the banks of the Tiber. As Bond ventures towards the heart of the sinister organisation known as Spectre, he learns of a chilling connection between himself and the enemy he seeks. The 1964 film Goldfinger, the third film in the James Bond series, saw 007 partnered with the stunning Aston Martin DB5 for the very first time. In the 2012 release Skyfall, the DB5 made its sixth appearance opposite Bond and it was destroyed as James Bond and M came under attack at Skyfall, his family estate and childhood home in Scotland. In Spectre the DB5 has undergone complete restoration, courtesy of Q Branch. Aston Martin, the Aston Martin Wings logo and the model name "DB5" and "DB10" are trademarks owned, licensed or used by Aston Martin Lagonda Limited. All rights reserved.